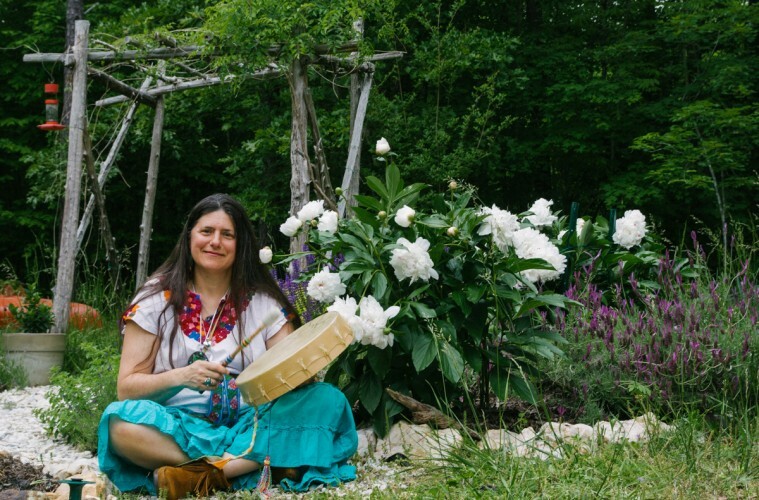 Welcome to Drumsong Sanctuary for the Soul, the therapy office and medicine lodge for Miriam Lieberman, MA, LPCS! Welcome to the therapy office and medicine lodge for Miriam Lieberman, MA, LPCS! The name Drumsong Sanctuary for the Soul came to me in a dream years ago before building a home and office here. I knew it was a significant dream and took note immediately. This is precisely what the land here fosters, the ability to take note of what is significant and essential in life and build on that. I work with people to heal what no longer serves them so they can devote their attention to what they wish to do with their lives. Like the forest, our lives are often cluttered with dead wood and debris that needs to be cleared out. We can do this ceremoniously by choice or we can be taken by storm with a lightening strike that blazes before us. The land here serves as a place to learn how to work with nature, including our own, rather than against it. Drumsong Sanctuary is located on a wooded ten-acre lot within a 250 acre corridor of minimally developed land. It is a 15 minute stroll from the Haw River, in the southwest corner of Orange County, North Carolina. This is precisely what the land here fosters, the ability to take note of what is significant and essential in life and build on that. I work with people to heal what no longer serves them so they can devote their attention to what they wish to do with their lives. It is a 20 minute drive through the countryside from Chapel Hill, Hillsborough and Mebane respectively. From Durham or Pittsboro (depending upon which end and route taken) it is a thirty or forty minute drive; and just under an hour from Raleigh. I have always felt that reconnecting to nature is an important part of the healing process for people with our fast paced, over extended and fragmented lifestyles. For this reason I have maintained a private office with close proximity to the natural world where we can tangibly feel our roots, look out the window at the hummingbirds, gardens in bloom, or fall leaves fluttering by. For some, the inner work may even take place outside. Children often benefit from strolls in the woods while working on their issues for example. Many a bereaved person has found solace, grounding and support sitting at the base of one of the grand beech trees found on the land. In this private setting freedom of expression is encouraged and aided by the non-judgmental spaciousness and comfort of the natural world. Time seems to be altered when we allow the beauty of nature to hold us in her healing embrace. On the land here we have a sweat lodge, women’s moon lodge, medicine wheel and fire circle for ceremony and drumming. See Pictures There is a creek that meanders through the ten acres and walking trails. The perennial gardens are in their glory through spring and summer attracting songbirds and butterflies. Deer may cross your path while approaching, please drive slowly. Sometimes we hold healing retreats here for people to come together on the land in ceremony, workshops, and gatherings all pitching in to create and experience a healing community. This rejuvenation, fresh perspective, and deep connection is then carried out into our lives and larger communities. Feel free to call Miriam Lieberman, MA, LPCS for an appointment for counseling, to request a ceremony, or to attend one of the group healings or ceremonies here at Drumsong Sanctuary for the Soul. This circle is currently full but there is a wait list for anyone interested should shifting occur. Do let me know of your interest. If enough people are interested perhaps a second group could form. Spirit has been whispering in my ear for a bit now to start another circle that meets on a regular basis (bi-weekly for starters) to deepen our relationship with our guides and helpers, to heal ourselves , to dream to the sacred beat of the drum, to share wisdom teachings and step out of the frenetic pace of life, to be authentic clear channels for spirit. I am proposing some dates (alternate Monday evenings beginning on All Souls Day). Once a group is formed we can decide together if these dates and times will work or need to be changed. I will be sharing teachings from the elders I have had the privilege to sit with, from my fifteen years of annual pilgrimage to vision quest in sacred community (as quester and supporter) and as one whose life purpose it is to serve and feed the people on this path with heart. I invite you to bring your wisdom teachings, healing gifts and spirit of love. The drums are calling to be played and for their medicine to be shared in the service of humanity. A suggested donation for the holding of the space and facilitation of the circle: $ 25.00. Deep gratitude to David Gellatly for the rights to use his photos. Go to http://davidgellatly.smugmug.com/ to view his galleries or call him at 919 304-5754 to reserve a time for a family photo session. Come bring your inspiration or find some here for yourself. The fire is where we lay down our fears and excuses and take responsibility for what we are willing and able to do to make this world a better place right now! Take strength, courage, love, light, growth, resilience, clarity, innocence, playfulness, and joy away with you. You will have the opportunity to release beliefs, grief, feelings, thoughts, relationships or anything else that is hampering your ability to be fully and completely who you are by offering them to the fire. We will witness each other as we make new agreements with spirit and dream our lives into being. We will feed the holies and ask their assistance in co-creating ourselves, our thoughts and our lives as we wish them to be. If your health and circumstance permit you to stay for the entire ceremony we appreciate that greatly and it is always ok to take care of yourself and your children so please plan accordingly. This is not about rules or permission, it is about respecting ourselves and others, witnessing and being witnessed in sacred community. The choice is yours! Monday December 31st 6-10pm please rsvp by December 30th . Workday Friday December 28 1-4 pm (or by private arrangements as you can make some time). People always ask me "how long does a lodge take?" My first thought is how much we need these ceremonies to take us back to soul time where it is the experience, the prayers, the being together in community, the work as worship that really matter and not the construct of time that we are forced to run our lives by. I have learned for myself to not schedule anything else on lodge days as I step outside of "time" to be present to what is, the stones, the fire, the people and their prayers, the feast and then basking in the richness afterwards. Please take care of yourselves however you need to with "time". You are welcome to join us for the time you can be with us and if you need to leave due to other commitments that is yours to keep track of. My wish for you is that you can be timeless with us and sink into the ceremony as it unfolds organically. If for some reason you need to leave during the lodge please be sure to let me and/or the firekeeper know so we can assist you. Workdays: I'm looking forward to hearing from those of you who want to build this community, be you newcomers, or those who have been here often to share in the love of lodge from beginning to end.